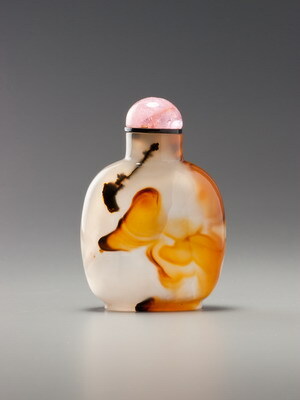 We are not at all sure how to date this unusual little bottle. The unglazed interior might suggest a date from early in the nineteenth century, and there is nothing about the nature of the blue or the drawing that would preclude such a date. Once underglaze decorated porcelain bottles came into vogue, there would have been many kilns making them at Jingdezhen, and they would not all have conformed to the same evolving style and choice of subject matters and borders. On the other hand, this densely-packed design of formalized peonies growing on what appears to be an endless vine appears on a range of blue-and-white wares from the later nineteenth century and on a good many snuff dishes that appear to date from the Daoguang or later. We have left a safe breadth of dating range, but suspect it will turn out to date from the earlier part of the century. Whenever it was made, it is of unusually good quality. 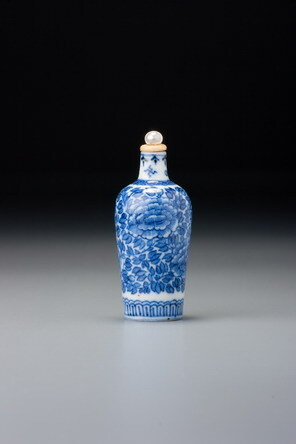 The bottle itself is very thinly potted, of perfect formal integrity, and well painted with excellent control of the cobalt pigment.